No one is more beautiful and inspiring than model Melanie Gaydos. Although she has been modeling for nearly three years, was flown to Europe to star in a video for the band Rammstein, and has had (or has lined up) shoots in New York, Los Angeles, Madrid, and Berlin, Gaydos is still finding her place in the world of high fashion. 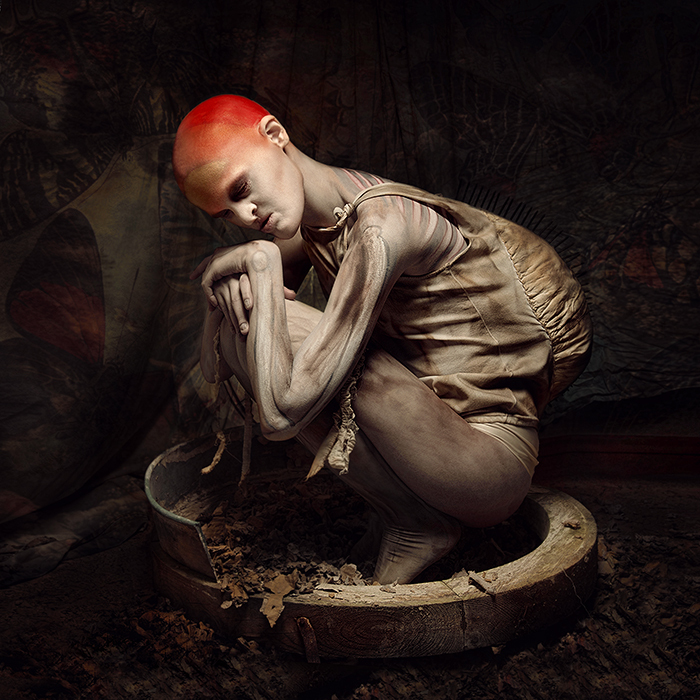 In the Mein Herz Brennt video the character of the Sandman is played by Melanie Gaydos. 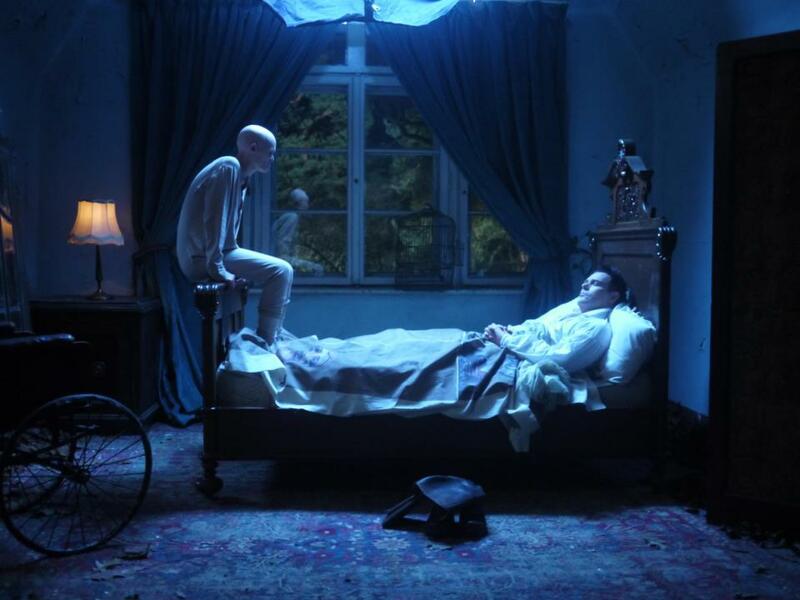 She first appears to a sleeping Richard Z. Kruspe, triggering nightmares and sending him into a state of agony. Meanwhile, Till plays a being who terrorizes the complex of Beelitz-Heilstätten, which acts an orphanage. He kidnaps the orphans and places them in a cage located in the main bathroom, despite a female warden attempting to defend the children with a shotgun, as Till overpowers her. The warden appears in the video both young (Lilith Becker) and old (Anna von Rüden), while Till remains the same age, indicating Till’s immortality and paranormal abilities. While guarding the orphans, Till takes a grotesque, insect-like form with an elongated head and fingers. The children are then used in various examinations and surgeries with the rest of the band playing the doctors. The female warden is also seen assisting them in her younger form. One of the surgeries sees a child’s tears extracted through a syringe, which is then vaginally injected by the Sandman. The Sandman is also subject to examinations by the doctors, as Paul H. Landers is seen giving her a gynecological examination. She later walks in a dress shielding two small children, possibly indicating that the tears are involved in a form of In vitro fertilisation. While Till is away from the main bathroom, the children (portrayed by the rest of the band as disheveled adults) escape from the their cage and the orphanage. This causes Till to tear out and consume his own heart while the Heilstätten is engulfed in an inferno. 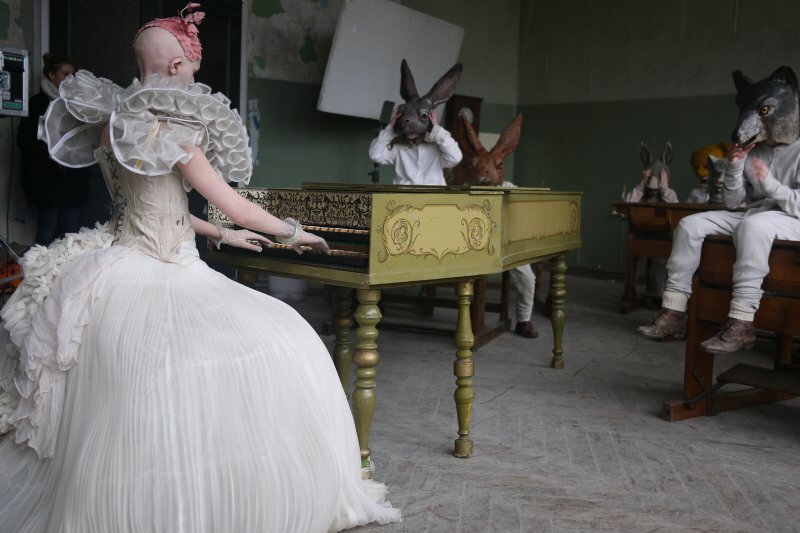 The video ends with the liberated walking away from the building, while the chorus of the piano version plays in the background, signalling the video of the piano version as an afterword. SMM: How did you get started in modeling and how long have you been modeling for? MG: I have been modelling for exactly a year and a half as of January 1st, 2013. I have always been friends with very creative people but rarely let anyone take my photo. I was interested in a lot of self portraiture for my own artwork though. After I had moved to NYC from Connecticut, I met so many amazing artists that lived so close to me. I knew I had to meet and connect with them. SMM: Is that how Rammstein discover you for their music video? MG: I had been in contact with photographer and director Eugenio Recuenco and he asked me if I was interested or available for a heavy metal music video in Germany. Though I did not know exactly who it was for at the beginning, I had a *feeling* and knew I had to do it anyway. I was still in my school semester and hadn’t a passport but saved up from all of my shoots to get a passport really quickly and my school semester ended exactly the same morning of my flight to Berlin! SMM: Were you a fan of Rammstein before they contacted you (If not, are you a fan now?)? MG: I was definitely a fan of theirs when I was much younger, about twelve and in middle school all throughout my teenage years. My life changed a lot when I moved to NYC, as did my own perspectives so I drifted away from heavy metal music but “Mein Herz Brennt” and “Engel” were my top favorite songs of theirs growing up. The shoot was definitely a dream I loved the video for “Sonne” very much as well. SMM: How was your time in Germany? MG: I had a fantastic time in Germany!! I found it incredibly relaxing, the culture and atmosphere was a really good environment to be in.. Maybe it was just because my week of finals and school semester had JUST ended the morning of my flight from NYC to Berlin, but Berlin was really a wonderful adjustment. I had a beautiful time talking and getting to know everyone on the creative and styling teams, as well as the hotel I stayed in – they were so sweet. SMM: What was it like shooting on a set with so many different languages? MG: It was really awesome! Though I cannot speak Spanish as well as a native, or really fluently at all, I was thankful to have studied it for seven years in grade school. Even though I did not understand very much Dutch or German, I found their approach and personalities not too different from Americans or people I talk to in NYC or New England. It was easy for me to communicate with them, much of the shoot was intuition, as the band and Eugenio Recuenco had mentioned in “Making of the Video”. I sat with Eugenio and Cata, the assistant director for a long time the first night we met, talking about the inspirations and references for the video. They had a giant book of inspirations that I studied; the clothing as well was really inspirational and as I was already a fan of Recuenco’s work, I think I knew what he was looking for. Much of the shoot, as well as any other situation, requires you to be present. It is always better to be aware of what is going on. SMM: How was it working with the members of Rammstein? MG: It was amazing! I used to travel and follow bands, as well as follow the local music scene in Connecticut quite actively when I was in high school. So I was used to hanging out with people who are “chased after” in a way. Regardless of what someone does or who the rest of the world knows them as, they are people just like you and me. They were all very sweet and funny guys. I very much enjoyed the time I spent with them. SMM: What were some of your favorite moments? MG: The entire trip and shoot for me was one giant favorite moment. For months I would dream about Germany! I thought about it quite a lot. One of my most favorite moments was when I first stepped onto the grounds of the shoot from my car for the first time, and then meeting Till who was standing and having coffee. He was so tall and I skipped up to him and said “HI”. Haha, I think he was quite surprised to see me, maybe it was my voice or how small I was (I photograph quite taller) and we shook hands. I also enjoyed sharing meals with Eugenio Recuenco and his directing team, as well as eating lunch with the production team and Oliver. There were so many small moments! I loved it all. SMM: There was mention in “The Making Of” that you are invited back to Germany to hang with the band, what do you hope to do on your next trip over there? MG: During the shoot they asked me if I’d like to go to their NYC show and come see them! I was very excited and saw them when they played in NYC in April at the Nassau Colosseum. It was a really awesome night. I am planning to go back to Germany though sometime this year because I have made quite a few friends over there since last year. First and foremost it will be a photography trip though, which all of my friends are photographers or artists So I plan to stay and shoot quite a lot when I am there!